You feel (almost) silly wanting a tarot reading because it could all be so much worse. You’ve got some amazing friends. Work’s alright (but you aren’t loving it). According to your instagram grid, you’ve got it all. Nobody would even know that there was anything wrong from the outside. Behind the scenes: Anxiety keeps stalking you. You know there’s something missing but you don’t know where to begin. Wondering about your next move? You, me and the Tarot. You’re looking for some guidance and clarity; or you’re simply curious to see what the cards are saying. 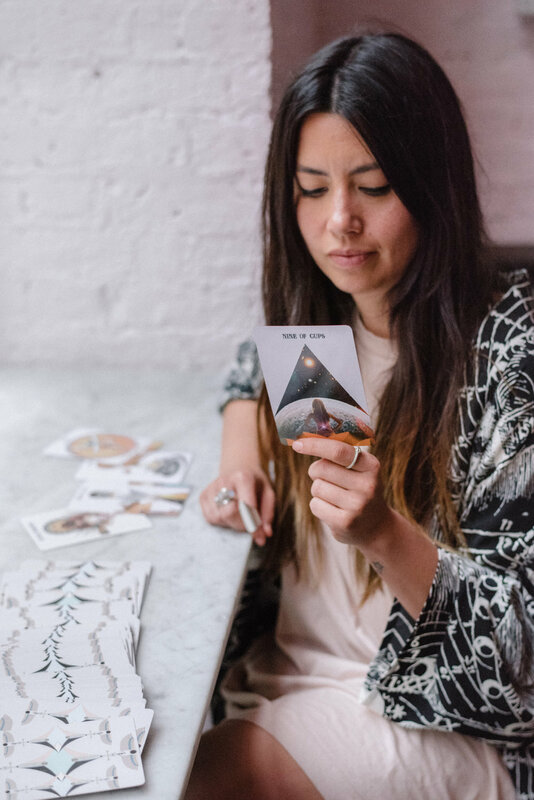 Tarot readings can conjure up impressions of crystal balls and future predictions; there are so many misconceptions around what the tarot is all about. Let’s talk about what you need to get clear on, today. Because it has nothing to do with the future and everything in the here and now. Having a tarot reading is like being given a map to destination clarity. Every card in the deck represents part of your experience. When they’re laid out in a reading, they act as a mirror to reflect your current situation; influences, challenges, strengths and hopes. During this session, I’ll guide you to see the bigger picture so that you can turn uncertainty into a transformative opportunity. Sometimes we need to feel lost so that we can find ourselves. Come and get clear on your truth, so that you can manifest the future that you’ve been daydreaming about. My Tarot reading was so enlightening and I felt as light as a feather after; and slept really deeply?! My reading was amazing. I can’t tell you how much it’s inspired me. Like an arrow moving forward, I have so much purpose. I had so many moments of oh god I do that and oh I know I need to deal with that. Very much like a mirror. The mirror of truth. It left me feeling very revved up and ready to get on!